Are you trying hard to raise your voice for any cause or event but not getting success? WristbandBuddy offers you the most authentic way to promote your cause in the form of awareness wristbands. An awareness bracelet is the best way to promote a cause or an event that is very close to your heart. We provide our clients with the fast reliable services so that the bands can be delivered in a very short time as you order. One can easily design his own bracelet from start to finish using wristbands customizer. We offer a wide range of color and style options so that you do not have to face difficulty while including a logo or slogan to spread your message. As we know creating curiosity among people can lead to great marketing. So these silicone wristbands are the best way to make your brand popular among the people. .
Best known for its trustworthiness and anti-allergic nature, we offer you the most reliable services to spread your cause among the youth. 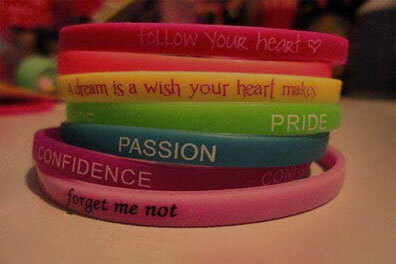 One can buy the wristband of a specific color to show his support for a cause. Even if you are looking for any type of customized wristband, our experts assist you with taking a right decision. Also, our bands are 100% latex free and do not cause any irritation to the skin. So there is no need to worry about any reaction caused by the band.